Cardboard at its best is an imperfect, extremely unspectacular material that is very familiar yet often ignored. It is cheap and disposable, but in the hands of an artist this material can become rather interesting and very beautiful. There is a moment of pause and reflection that happens when something so utilitarian becomes something else, when the overlooked can become memorialized and celebrated for its beauty. In the latest show, cardboard at RNG Gallery, this material is repurposed using various mediums to show how it can mutate by constructing and deconstructing it beyond recognition. Greeting you as you enter the space is a sculpture by Iggy Sumnik. “Look Up” is a series of surveillance cameras mounted with clouds and stars around it. Skillfully crafted and painted white, the piece blends into the background, but there is a feeling that big brother is always watching. Phil Hawkins piece “Corner Day Glow” is one of the stars of the show. Its construction is so amazing you question if this is cardboard. It is a totem pole of geometric shapes painted with bold and vivid colors. He designed them with imagination and invention grounded in architecture. Performance artist Doug Hayko, who made an appearance at the opening, also allows the viewer to reflect on the practicality of how some use cardboard in our society, as he lay covered with it on the floor throughout the opening. Hayko was there to make us think about “Who Cares What a Man Was?” while sharing his vision of homelessness, reminding us that this material is also functional and not shying away from the conversation of those who are displaced. His “blanket” was a Kenneth Cole Reaction box while he clutched his belongings in a plastic bag. Onlookers left money and food and also vandalized his blanket. “Maybe it Does Matter” is a piece by Jeff King. His skillful rendition of a skull surrounded by drugs questions the mortality of self and the destruction that can come about when dealing with demons that can be beyond our control. Painted in bubble gum colors, the palette is in vast contrast with the visual image the piece conveys. Freddy Ricon’s “Doc Holiday” was a masterfully sculpted piece. 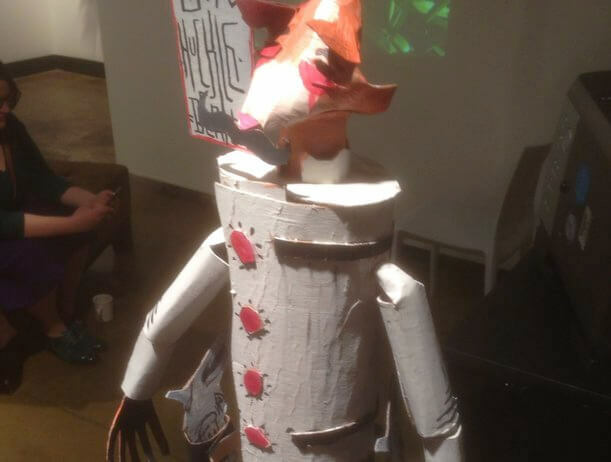 Depicting a movie icon, but with a twist, his fox sculpture shows his talent using a variety of media. Rincon is a young artist, bursting with energy and ideas, and he is not afraid to experiment with materials. Kim Reid Kuhn also has pieces in the show that illustrate her skillfulness at painting on anything. “Whet Whistle,” is massive, and its colors of Pepto Bismol pink and muted reds and blues make this eye-popping work seem to be a nod to zombies and what could be, not what is. This show explores the space between what is unsightly and what is beautiful. There is a challenge of aesthetics that create an underlying sense of tension through contrasts of form and structure. There is a difference between seeing things and looking at things and to understand that the intrinsic material is pushed to its limit and realize that there is a contradiction between what is discarded and what is desired. cardBOARD continues through January 4th, 2015 at RNG Gallery, 157 West Broadway. For details and hours, go to dixiequicks.com or call 712-256-4140.